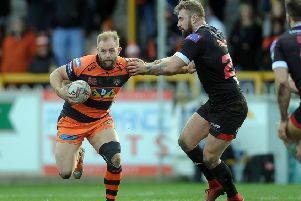 Daryl Powell’s team were the surprise package last season securing their best-ever Super League finish of fourth and reaching the Challenge Cup final. And, although their start to this year was poor, they currently have the best record around. The West Yorkshire club are seeking a sixth successive win at Hull FC on Sunday and if they achieve that, and Huddersfield slip up at St Helens tonight, they will venture back into the leading quartet once more with just two regular rounds remaining. Holmes, 22, admitted: “We are a small club. We are not like St Helens or Wigan where they have excellent facilities and things like that. “Our fan base is strong but it is not as big as Wigan or Saints and fans look at it that way – that we should be down a bit lower than where we are. But I don’t think that is the case with us. We know we are a top-four team. Castleford were handed a further boost in their efforts to gain greater punching power last week when the government decided it did not need to “call in” the planning application for a major redevelopment which includes a new 10,000 capacity stadium. Holmes said: “It is another positive and it helps with the lads contract-wise; a lot of people will be thinking this club really is moving forward now. In terms of improvement, there is no doubting Holmes’s own progression as the Tigers academy product continues to be one of the competition’s most consistent back-rows. He puts that down, in part, to those around him and explained: “Luke Gale’s just got player of the month so having your half-back playing that well always helps and I’ve (centre) Michael Shenton and (winger) Justin Carney outside so our left edge is pretty strong.